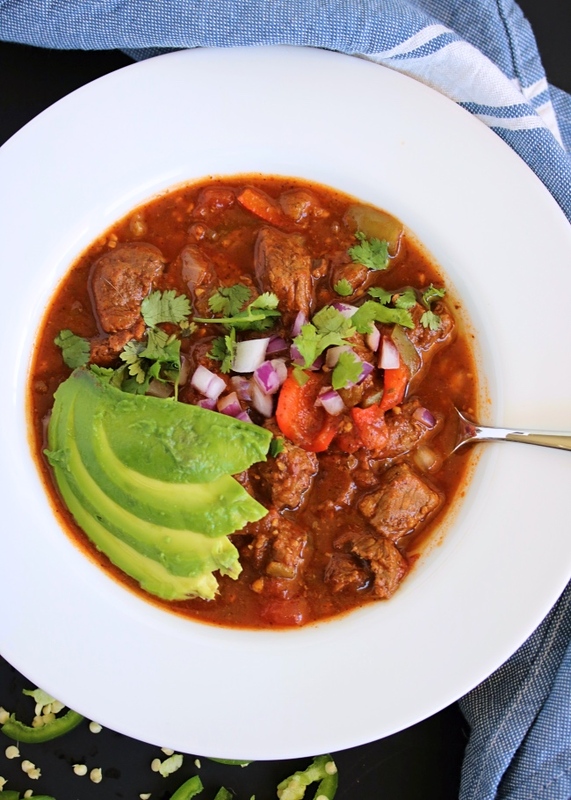 One of our favorite easy, go-to meals when we just have the basics in the fridge & pantry? Chili. It's seriously been a favorite of ours for years! When I lived on my own in grad school, I loved huge-batch meals that I could prep once and eat all week long. Now that I live with a hungry husband who eats a lot more than I do, "huge" meals don't stretch quite as far as they used to. But with a dish like this, I can easily make it last for days by switching up how it's served! Think chili dog bowls, or scooping your chili over a baked potato. Not doing a Whole30? Add some crushed grain-free chips and some grass-fed cheese or sour cream over top. 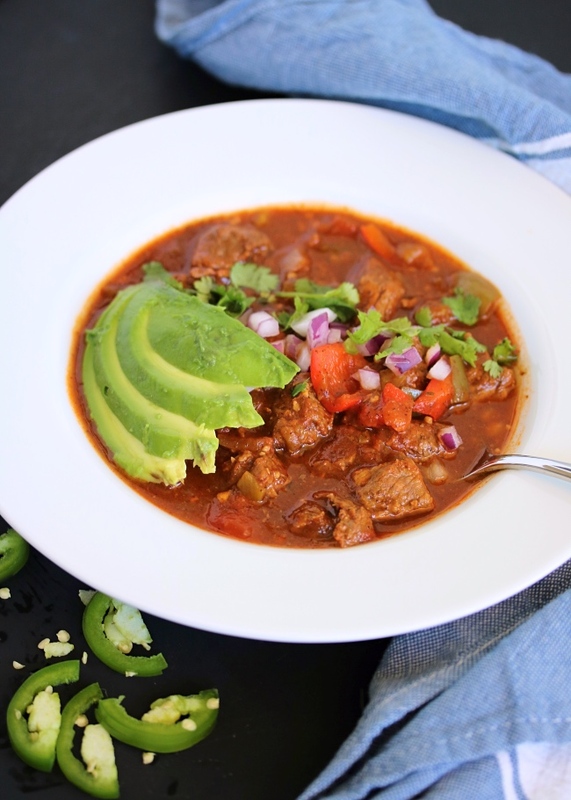 You can load this chili up in so many ways, it never gets old! 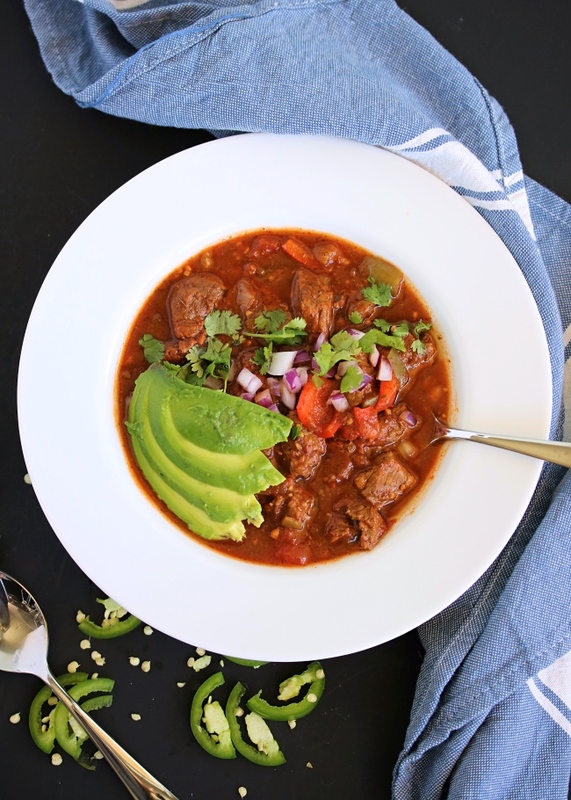 I decided to make this version in the Instant Pot because it's quick, easy, and so convenient for those days when you want to cook but haven't prepped ahead of time. Still a slow cooker fan? I've got instructions for that too in the "notes" below. I love using beef stew meat in this when I've got it on hand, because once it's done cooking it seriously melts in your mouth. But to be honest, ground beef is what's *usually* in our freezer, so I often use that too! Work with what you have, it will be delicious either way. Speaking of deliciousness: try this stuffed into a baked potato, and drizzled with Whole30 compliant ranch. SO GOOD. I went through a major no-ranch phase during the first trimester of my pregnancy, because let's face it- basically everything sounded terrible. But now we are out of the food aversion woods and I am so dang happy to have that ranch back in my life. 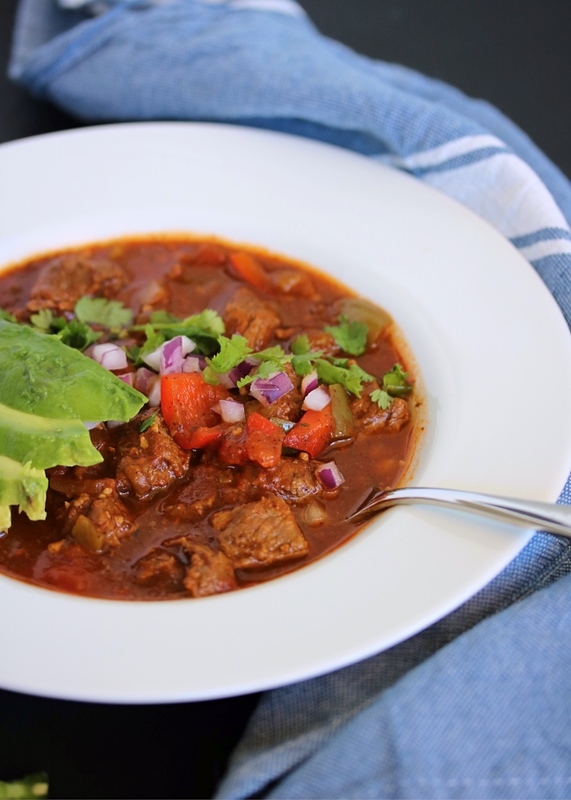 It makes everything taste just a little bit better & brings some extra life to this chili! A must try! I hope you guys love these easy meal as much as we do. Let me know how you serve it up, and come tag me on Instagram if you do make it! Set the Instant Pot to "sauté" mode. Once the metal insert is hot, melt a tablespoon of cooking fat (I like avocado oil). Add the beef, cooking until browned on each side (don't worry about cooking it through). Add the bell peppers and onions, and cook for 2-3 minutes, until just softened. Stir in the tomato paste, minced garlic, and spices, and give it a good stir. Add the diced tomatoes, tomato sauce, green chiles, and coconut aminos. Stir until combined then place the lid on top of the Instant Pot. Season with additional salt to taste, and serve hot with your choice of garnishes on top. Enjoy! 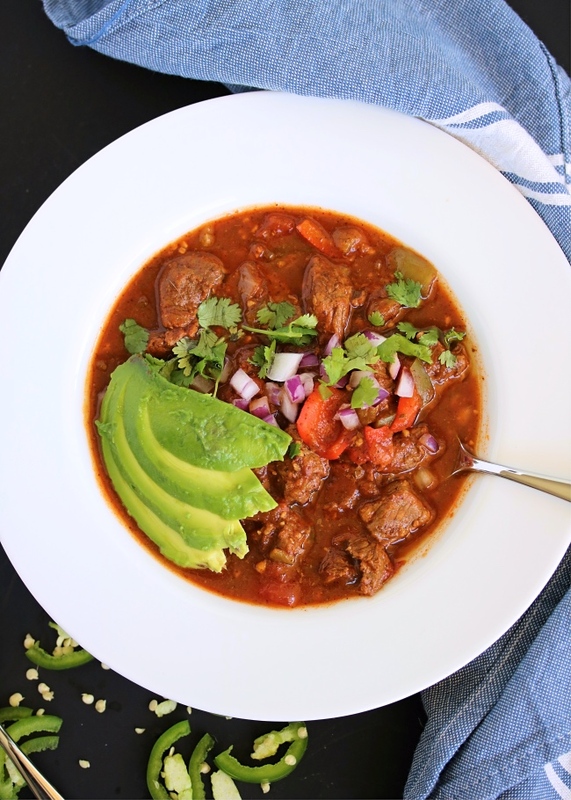 SLOW COOKER: To make this in your slow cooker, complete steps 1 and 2 on the stovetop in a large skillet. Transfer the meat and vegetables to the slow cooker, add the remaining ingredients, and give it a good stir. Cook on "low" for 6 to 8 hours. This makes an excellent "meal prep" dish that you can serve in a variety of ways! We love it served straight from the bowl, or scooped over a baked russet or sweet potato. 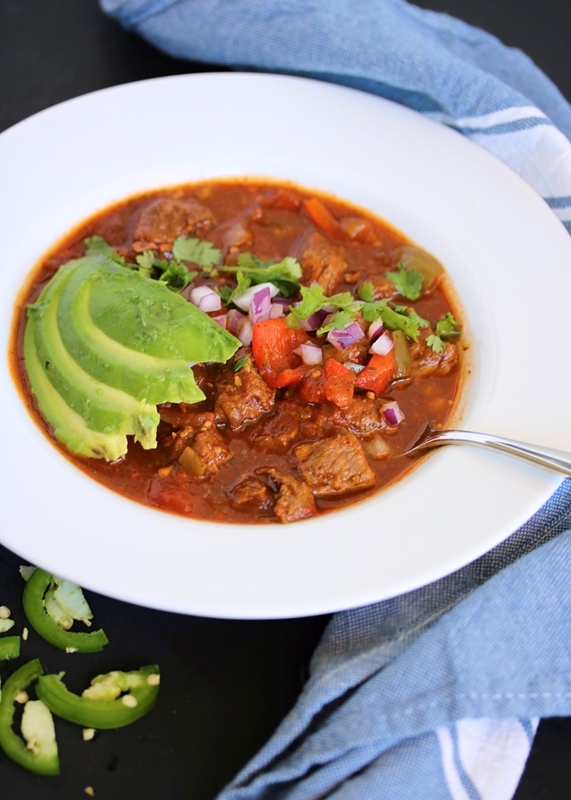 I made this chili for my first day on my first Whole 30 and it was so delicious! My husband said “I can do this diet for 30 days if the food is going to be this good!” Thank you for sharing recipes with everyone. I’m so appreciative. Hope you are enjoying lots of snuggles with your little one!